While there is no formal national mechanism to monitor, evaluate and report on the Sustainable Development Agenda by the Government, the Sri Lanka Stakeholder SDG Platform, which prepared the ‘Sri Lanka Voluntary People’s Review on SDGs,’ will hand over the report during the UN High-Level Political Forum (UNHLPF) to be held from 9 to 18 July in Geneva. A first-of-its-kind, the Sri Lanka Voluntary People’s Review on SDGs 2018 is an initiative to monitor and report on the status of implementing the Sustainable Development Goals (SDGs) keeping with the objectives of inclusive transformation towards sustainable development. In September 2015, the Government signed the new global agreement on Transforming our World: The 2030 Agenda for Sustainable Development, in which all the signatory countries have to prepare their voluntary reviews, spelling out their national realities and circumstances. The SDGs were first set at the United Nations Conference on Sustainable Development held in Rio de Janeiro in 2012. It is a set of aspiration that guides the signatory countries to take action to end poverty, to protect the planet and to ensure that all people enjoy peace and prosperity before 2030. It makes governments around the world put the aspirations on paper into action. 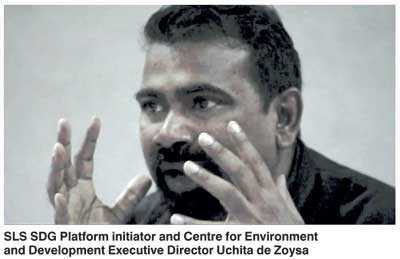 The initiator of the Sri Lanka Stakeholder SDG Platform (SLS SDG Platform) and Centre for Environment and Development Executive Director Uchita de Zoysa in an interview with Daily FT said that the 2030 SDG agenda meant to transform the world and replace Agenda 21 of 1992, which was then called the last chance to save the earth. “Since becoming a signatory to this Agenda in 2015, the Government has taken some commendable initiatives, including creating a Cabinet Ministry on Sustainable Development, enacting the Sustainable Development Act in Parliament, establishing a Parliamentary Select Committee on the SDGs, declaring a sustainable era and the appointment of a Presidential Expert Committee on drafting a Vision for 2030, to facilitate the SDGs. But unfortunately, this initial momentum towards a transformation created by the political leadership of the Government has not been executed by the highly-fragmented public administrative system,” De Zoysa claimed. He attributed this to the lack of a clear rationale and process to implement the SDGs; lack of policy coherence in planning prevents proper mainstreaming, lack of institutional coherence planning impedes integration, lack of a monitoring, evaluation, follow-up and reporting mechanism prevent honest stock-taking, and lack of a sustainable development budgeting and a financing architecture prevents true commitment to transformation. He also claimed that the Government was yet to formulate a national SDG roadmap, establish the baseline indicators and streamline the supporting data towards enabling a systematic assessment of the progress made transforming the nation towards sustainable development by the year 2030. “In this sense, it is unclear as to the methodology used in taking stock of the current status of sustainable development in preparing its VNR. Under the collective agreement of ‘leaving no one behind’, the VNRs must reflect the true status of transformation through an honest and inclusive stocktaking,” he said. According to De Zoysa, the Government-led VNR process had generated limited interest and engagement by the political hierarchy and therefore lacked leadership and direction. In a bureaucratic process managed by officials of the Ministry of Sustainable Development, Wildlife and Regional Development and the hired consultant, stakeholder engagement appeared too superficial for an honest outcome. The SLS SDG Platform was established in March 2018 by a collective of CSOs, the private sector, academia, professional associations, trade unions, etc. to facilitate an inclusive transformation towards sustainable development in Sri Lanka. Objectives of the ‘SLS SDG Platform’ are to facilitate an inclusive transformation and independent monitoring and reporting on the implementation of SDGs in Sri Lanka. 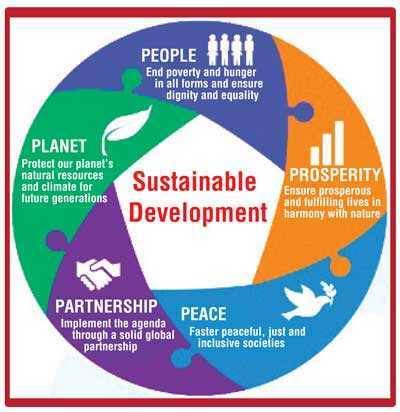 “Towards ensuring accountability of the implementation of the SDGs, representatives from civil society, business, academia, media, as well as local and national government should be able to congregate periodically to assess our status on sustainability and devise collective strategies for prosperity. A single platform is thus established to support the Government’s vision for a sustainable era and extend collective alternatives towards convergent national policies and programs. A Platform Facility has been established to coordinate the outreach, communications, research, training activities and advocacy. He noted that despite the reality in the country, some organisations were presenting a different picture to the world through their reports, ignoring the reality through the eyes of the ordinary people who face the issues daily. “Sri Lanka is preparing reports for the world but without addressing the realities in the country. Therefore, do we need reports to show off or to drive the country towards prosperity from the perspective of stakeholders and people? Reports to the international community must be a reflection on the true pathways and status of prosperity of the nation, not cover up the true picture and paint another. This is not about the game of reports but a game of sustainability, prosperity and peace in the country,” he said. Referring to 17 SDGs, 169 targets and 232 globally set indicators to measure the targets, de Zoysa claimed that although Sri Lanka needs to set local indicators based on the baseline, we are yet to set most of them. He said that the Department of Census and Statistics stated there were data for about 46 local indicators for 232 globally set indicators and they had the capacity to develop new modules to find data for some 29 indicators, but this still leaves a gap in terms of nationally verified data for most of the indicators. We have a problem of coordinating data for the rest of the targets while having 425-odd legally-mandated statutory bodies under all the ministries. What is the rationale or the foundation to go for a sustainable era, when the country doesn’t have a proper plan for that at the moment?” he claimed. De Zoysa said that although time to time roadmaps and strategic plans were announced, the country needed a rationale which included the people who were living at present and also those who were yet to be born, where both could be benefitted. He said that when studied it was found that for SDG 1.5,regarding building resilience of the poor, 21 ministries and 45 State agencies must be bought together. Similarly, SDG 13.1 which is about building climate resilience has 31 agencies under 14 ministries responsible for implementation. While all of these agencies need to be brought under one umbrella and work out integrated plans and implementation it was a daunting task to bring them together as the officials in each of these institutions work in isolation. “The Government spends a huge amount of public funds on these projects and they work in isolation not due to any political reason but due to the fragmented institutional design and official agendas. Especially the officers who work on the same field of an area in these institutions do not know each other and no communication is taking place among them,” de Zoysa, who was the former Adviser to the Minister of Sustainable Development Gamini Jayawickrama Perera, said. However, commending the Government’s serious concern on sustainable development, he said that since 2015, the Government had shown tremendous political momentum for the sustainable development compared to many countries in the world. He said while political momentum was high on the sustainable development agenda in 2016 and 2017, there was a low public sector response in mainstreaming, integration and implementation of the SDGs. The country has a whole lot of plans to cover all the sectors but it has no clear monitoring and evaluation mechanism to measure the targets of the SDGs. “There are about 80 national policies relevant just for SDG 12, which ensures sustainable consumption and production patterns but who is implementing and monitoring the implementation,” he said. De Zoysa said through the Voluntary People’s Review everyone had an opportunity to be a part in the process to give their ideas on achieving SDGs and no one would be left behind in the process to have an inclusive transformation. The lack of an honest space for engagement in the official VNR process and limited scope of investigation into truthful stocktaking compelled stakeholders to seek an alternative reporting pathway. The voluntary process was able to draw over 500 direct contributors from Government, academia, CSO, CBO, business and other stakeholders during the period of formulating the VPR. “Even the regional consultations drew politicians and Government officials representing provincial, district and local government levels. The senior experts in their respective fields were engaged along with farmers, fishermen, women and youth to seek clarity in understanding the ramification of policy determinations and development interventions,” he explained. De Zoysa said that the VPR formulating process was important similarly to the outcome as it helped to build the foundations for an independent monitoring and reporting mechanism for SDGs and also towards establishing a collective process of transformation that reinforces the principle of leaving no one behind. The final report has two key sections, which provide a macro analysis on the state of planning and implementing the SDGs and the reviews of the 17 SDGs. De Zoysa said that as the official VNR process in Sri Lanka had not demonstrated an inclusive intent and a clear rationale, SLS SDG Platform, which had prepared the VPR through a consultative and fact-finding process, would present it at the UNSLPF 2018 ensuring no one is left behind in the implementation of the SDGs.